"Inside the Cage" takes place at the Jackal's Staff where a young cougar seeks to escape his life of prostitution. Illustrated by Vince Suzukawa. "The Prisoner's Release" previously appeared in Heat #1 and Heat #2 and tells the story of how Volle met Streak. 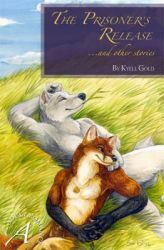 The illustrations done by Taurin Fox for Heat are reprinted here. "Home Again" picks up just after "The Prisoner's Release" when Volle and Streak have returned Ferrenis and fills in some details leading up to their ill-fated return to Tephos in "Pendant of Fortune." Adam Wan provides a single stunning illustration for this short story. Finally we return to the Jackal's Staff in "For Love or Family", this time through the eyes of a patron trying to balance the way he feels against the duties of his station. Arthur Husky provides the illustrations.